For several years now, we’ve been planning the 150th anniversary of the incorporation of Evanston as a town on December 29, 1863. We’ve held a brainstorming process called Evanston150, resulting in ten big ideas for Evanston’s future, and planned a celebratory year that has included multiple anniversary events and the collection of more than a 150,000 hours of volunteer time. Here at the Evanston History Center, we’ve mounted a new maps exhibit; re-published a popular history of the community; and participated in all the planning for Evanston150 and the anniversary year. Yet even with all this, there is still something yet to be done — figuring out why our forefathers (yes, they were all men) decided to hold a vote and incorporate the town on December 29th 1863. One can imagine it was as cold and snowy on that December evening as it is generally today. Why would they choose to meet and incorporate then? Was there a change in state law coming on January 1st as is customary today? The country was in the midst of the civil war and many young men from Evanston and Northwestern University had gone to fight. Did it have something to do with that? Was there another pressing reason for action to be taken? Though we can find recorded details about the incorporation itself, we can’t seem to find the reason behind the action on that December night. Here’s what we do know about Evanston in 1863 (these details are for the most part taken from the earliest history of Evanston, which is included in the History of Cook County, Illinois by A.T. Andreas, published in 1884). The earliest white settlers of the community had arrived in the 1840s as the city of Chicago began to grow to the south. These settlers were for the most part farmers and settled along the Native American trails that became roads (Ridge Avenue and Chicago Avenue) where the land was drier and travel north and south was easier. This early community was first called Gross Point and then Ridgeville. Ridgeville Township was established in 1850 and was the first governing body of the area. In 1853, trustees for the newly established Northwestern University purchased large tracts of land along the lake in Ridgeville Township to establish their university and to plan a town, the selling of lots for which would provide funds for the university. The town, which they named Evanston, was platted by university surveyors in 1853 and 1854, and streets and alleys were graded as the lots for the town were laid out. In 1855, with the coming of a railroad line linking Evanston and Chicago, the University petitioned for two amendments to its charter — the first would allow it to forgo paying property taxes, as it was providing the benefit of higher education; the second would establish a four-mile limit surrounding the university that would prevent the distribution, sale and production of alcohol. The latter amendment firmly established the character of the new town as one of sobriety and learning. 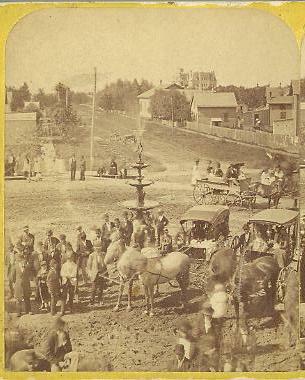 The name of the township was changed to Evanston in 1857. Davis Street was the main street and here’s what was there, both east and west of the tracks, in 1861 — a tailor; several general stores (one of which was also the Post Office); a drug store; a paint shop; a butcher shop; a tavern (presumably not serving alcohol); a boarding house; a feed store; and a blacksmith. Northwestern’s earliest building was also located on Davis, on the northwest corner of Davis and Hinman. In January, five trustees were chosen and “in July, 1864 the town rules and ordinances were adopted. The offices created were the trustees, clerk, treasurer, attorney, street commissioner and constable. In addition to the usual ordinances passed was one enforcing the provision of the University charter in regard to the sale of liquor. The sale of any intoxicating beverage was declared a public nuisance, and a fine of $50 [approximately $1350 today] was to be imposed upon any one violating the law in the regard within the town limits. The ordinance and the provision of the University charter are still in force, and Evanston has become noted, far and wide, for the sobriety and prosperity of her citizens.” The first expenditures of the town government were for improving and repairing the streets and paying an assessor to survey and estimate the value of the land for taxing purposes. There are hints in later written histories about the question of why they incorporated on December 29th 1863. One history says that there was “agitation” by residents of the newly platted town for “a narrow and more intensive government.” Another credits concerns over enforcing the 4 mile limit. But there is no written record nor full explanation. Evanston in 1863 was a small, country town with dirt streets, no sidewalks, and no electricity, gas or phone lines. It was a farm town filled with aspirations to be something more. And so, they met that cold December night to make it official and the town of Evanston was born. We may never know exactly why they did so, but we do know we are glad for the 150 years of history that followed. Happy 150th Anniversary Evanston! Here’s to many more! History of Cook County, Illinois, by A.T. Andreas, 1884. A Classic Town: The Story of Evanston By “An Old Timer,” by Frances E. Willard, 1891. Historical Encyclopedia of Illinois and History of Evanston, by Harvey Hurd and Robert Sheppard, 1906. Northwestern University, A History, 1850-1975, by Harold Williamson and Payson Wild, 1976. Creating Chicago’s North Shore, by Michael Ebner, 1988.